The Ontario Museum of History & Art and Guest Curator, Jerry Weems, present Diversity and Inclusion: The Influence of African-American Art in Southern California on exhibit now through Sunday, February 25, 2018. This open call exhibit displays how regional artists are influenced by the raw and expressive beauty of the African-American experience. Visitors will enjoy viewing artwork with a wide range of subject matter and technique. Diversity and Inclusion features fifty-one artists of different race and ethnic backgrounds who use a variety of media such as oil, acrylic, clay, metal, fiber, textiles, photography, ink, graphite, and installations. Diversity and Inclusion will “showcase the arts of individuals that are truly underrepresented in the cultural landscape of Southern California. There is a great deal of talent and creativity that is being overlooked by galleries and educational institutions. It’s our desire to bring recognition/affirmation of these participating visual artists and provide a venue that their work can be seen,” Jerry Weems, Guest Curator. The main mission of this exhibit is to educate and present the various artistic expressions that best illuminates the ideals and aesthetics of Diversity and Inclusion. Exhibiting artists are Allyson Allen, Bill Anderson, A.S. Ashley, Sharon Barnes, Mirla Bernasconi, Akeem Brandon, Jean Brantley, Demarcus Brown, Lisa Cabrera, Art Carrillo, Vanessa Cobarrubias, Carolyn Cunningham, Otha “Vakseen” Davis, III, Valena Dismukes, Katie Foley-Meyer, Tom Fontanes, Tony Gangitano, Tm Gratkowski, Grace Lynne Haynes, Sy Hearn, Capt. James, Bruce Jones, Alex Ledante, Talita Long, Richard May, III, Laurence Merrill-Dillman, Melinda Milton, Eric Myles, Riea Owens, Pache Pace, Juan Pacheco, Cat Chiu Phillips, Theresa Polley-Shellcroft, Christian Ramirez, Zachariah Rivera, LP Ǽkili Ross, Lyle Rushing, Lisa Isabella Russo, Jermaine Saunders, Sarah Stone, Katherine Taylor, Linda Ternoir, Steve Thomas, Virginia Vilichis, Lisa Diane Wedgeworth, Jerry Weems, Chris Wesley, Cynthia Wierschen, Patricia Woodlin, Karien Zachery. 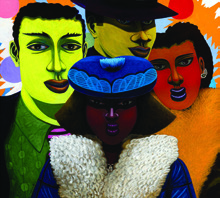 Meet the artists of Diversity and Inclusion: The Influence of African-American Art in Southern California exhibit and attend an Artist Talk highlighting the exhibit topics. Light refreshments and hors d’oeuvers will be served. Program is free, reservations required. Call the Museum at (909) 395-2510 for additional information and to make reservations.